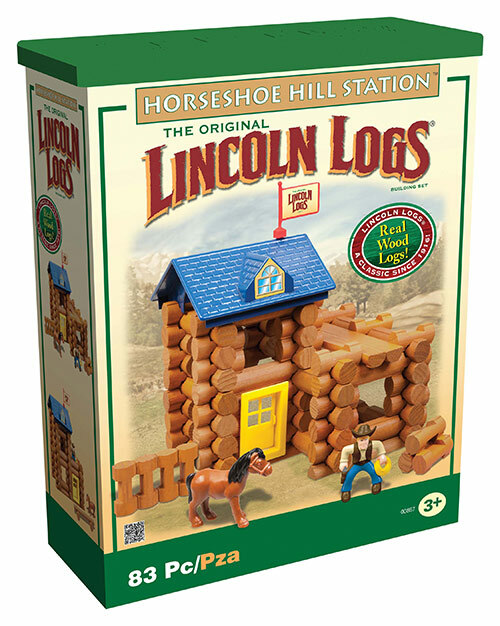 Saddle up to the LINCOLN LOGS Horseshoe Hill Station! This building set features 83 pieces including real wood logs, a cowboy, a horse, a roof and a door. Set also comes with colorful, step-by-step building instructions. When playtime is over, put the parts back into the handy storage container for a quick and easy clean-up. Suggested retail price is $27.99. Ages 3+. Available now on knex.com and at toy retailers nationwide. HASBRO and its logo, PLAYSKOOL and TINKERTOY are trademarks of Hasbro and are used with permission. Founded in 1992, K'NEX Brands, the world's most innovative construction toy company, was established to make and sell what has become one of the world's leading integrated construction systems for children. Winner of over 200 international awards and recognitions, K'NEX is America's building toy company focused on Building Worlds Kids Love, and encourages youngsters to “imagine, build and play.” Since 1992, The Rodon Group, a subsidiary of K'NEX Brands, L.P., has manufactured over 30 billion parts for the K'NEX building toy system. For more information, please visit http://www.knex.com or http://www.rodongroup.com. Hasbro, Inc. is a branded play company providing children and families around the world with a wide-range of immersive entertainment offerings based on the Company's world class brand portfolio. From toys and games, to television programming, motion pictures, video games and a comprehensive licensing program, Hasbro strives to delight its customers through the strategic leveraging of well-known and beloved brands. LINCOLN LOGS is a trademark of Hasbro and is used with permission. © 2011 Hasbro, Inc. All Rights Reserved.